Chad Mayes used to be the Republican Assembly Leader in California. He was dumped from power for siding with the Democrats on cap and trade. He delivered 8 Republicans votes for the bill – two of those votes allowed endangered Democrats in Republican leaning seats to vote no on the bill. 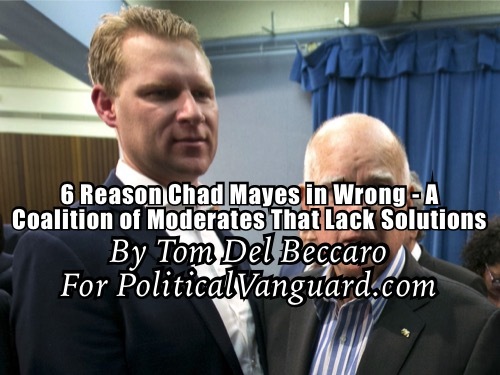 Now Chad Mayes thinks he even more answers to what ails California. Along with Arnold Schwarzenegger, he thinks there needs to be a Coalition of Moderates. Both of them are wrong. Here is why. Voters care more about solutions than they do labels. Moderate is a label not a solution. Republican statewide initiatives generally do better than their statewide candidates because the initiatives address specific issues with specific solutions. Being a fuzzy candidate is not a prescription for winning. Standing for something works better. Minority candidates and minority parties do not succeed adopting the agenda of the majority party. The majority party voters don’t vote for candidates of the other party unless they offer a better solution on a significant issue. This group does not understand the above. They believe that if they are like Democrats they can get elected by Democrats. That is false and always has been. Democrat voters already have their champions. They could be open to a solution on water, or on failed education, crime, etc. But they won’t vote or a Republican that parrots a Democrat any more than you would buy generic aspirin that costs the same as the name brand. This is a symbolic exercise not something that will produce results – as evidenced by the fact that that the end of Arnold’s term, Republican voter registration plummeted. If Republicans want to do well in this state, they need to focus on issues on which the Democrats are failing the state. Republicans need to offer concrete solutions on those failures and then reach voters with those solutions.